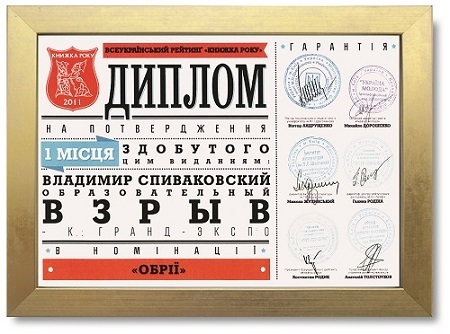 A new book by a famous researcher, businessman and author Vladimir Spivakovsky. 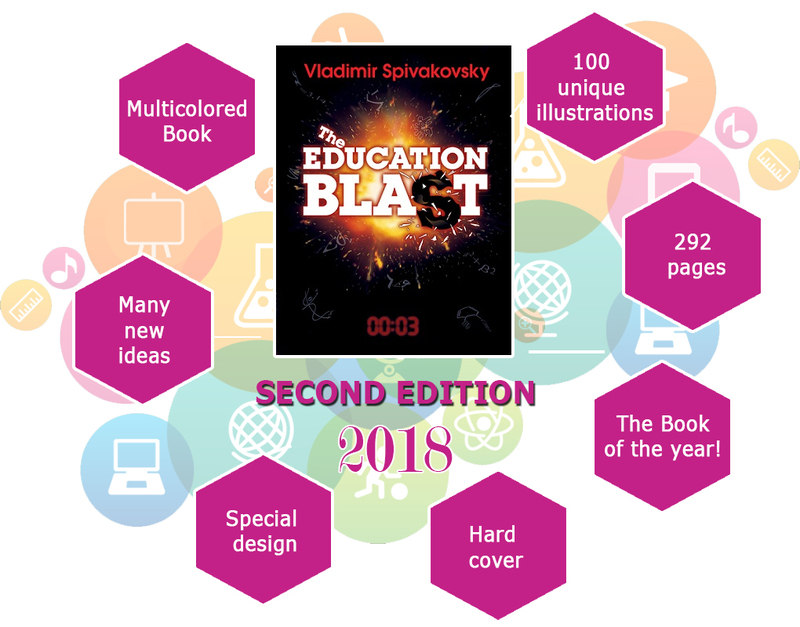 The author, backed by dozens of large scale business projects, and tired of waiting for Education reforms, decided to substitute the education system by a new one – as a global Knowledge Hypermarket and progressive Education System 7W, that will be suitable for children, parents, teachers, society, governments and the «progress» of humankind. Many books are dedicated to explain why education so weak everywhere, and receives so many complaints. However, rare who creates a holistic future education system with wide real experiences. Connection of basic academic skills with case studies, new technologies with design and environment, teachers-coaches with fine management – is a new wave of meeting the challenges of the 21 century: together with fundamental knowledge providing modern lessons of happiness, wealth, charisma, inheritance, luck, feelings and mind. It is perceived in the world as a new format for the schools, which is likely to become dominant in the next decades worldwide. Education system of a high 7W Standard aimed to get the answers on seven basic questions: Why learn? What to study? Who should teach? How to learn? Where to study? How much would it cost? What results to expect at the end of the day? Now we have the answers, proved and clear. The book is written in easy language, is full of aphorisms and fine illustrations. This book is a real manual for teacher's usefulness, student's relief, savings for governments and inspiration to clever people. For your convinience here you can see some pages to cast what does the book look like inside. 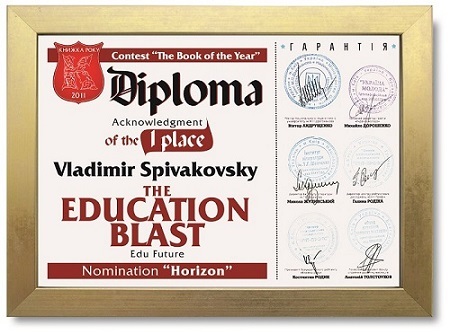 «The Education Blast» received an Award «The Book of The Year» among 3000 book-competitors of different genres in 2011. The First edition was published in 2011, which immediately became a bestseller. Many universities worldwide compose their fundamental pedagogical courses on this book. Half of school lessons – are just spam from the past. Knowledge must be collected like money on the Credit Card, in order to use it. Otherwise, there will be a notice: limit of your card has been exceeded. Don’t search the roots all the time. Look to the Sky. We need education not only for knowledge. We need it to identify who we are and how to improve the life. Chose the aim that is ahead of the time. What does the school produce indeed? Nobody knows. Education is needed to turn Mirrors into Windows. We definitely press the wrong buttons in education. That’s why we achieve wrong results. Brain is good. But you need an antenna to tune it. Formula 3 in 1: The best from the past + important from wherever + the main for the future. Why don’t people fly?.. I have better question: why don’t people fly upwards? The education blast has matured long since. The social order has already changed, but the education itself still follows the old path. This book is the breakthrough to the future and the knockdown of the present educational standstill, all in one. I have participated in many accreditation projects of the best private schools in the world. And what I have found in the book is amazing. It reflects dreams of all parents and teachers since the last decades. The education must be wise, modern, and relevant. This book meets all such high standards. The deeper knowledge a person gains, the wider range of skills and in more fields he or she may employ them. Consequently, his or her life is getting more and more interesting. This book shows how to gain such knowledge and how to make our life deeper and fuller. The book breaks down all established stereotypes, in which the educational system has sunk. This is a unique edition. It has re-structured the very core of knowledge, but in light of new sciences and knowledge with the end result. This is an indispensable book for Institutions of Higher Education and schools. It contains fine illustrations, and you read it in one breath. This is a product of thoroughgoing researches in combination with unique findings, which declares how wise and exciting the system of education can be for kids, their parents, teachers, and the society. I do bless stars for such possibility to communicate with GRAND Lyceum teachers. This is a great place. They are only few in the world. And I am happy to read the book, which runs for educational excellence. I am impressed with those advanced ideas, which are always fresh and unique with Vladimir.